Offering you a complete choice of products which include vintage one seater sofa in genuine leather, leather couches, vintage, leather restaurant chair, two seater canvas sofa, leather furniture, three seater canvas sofa, leather furniture, single seater brown leather sofa, leather furniture and vintage three seater sofa in genuine leather,leather couches. 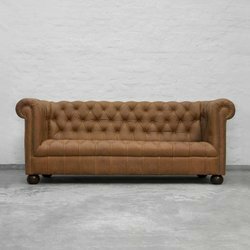 Chesterfield is inspired by the 1930’s chesterfield variations and provides a button tufted back and sides with a deep fixed seat. Handcrafted flaring scroll arms and rows of antique brass nail head trim lend elegance and style to the silhouette. 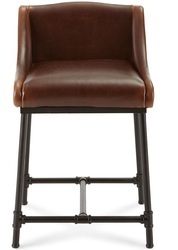 The front casters add that aristocratic touch to this classic design. 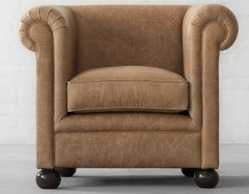 Shown here is a 1 Seater Regiment sofa in Espresso Vintage Scrunched Leather. 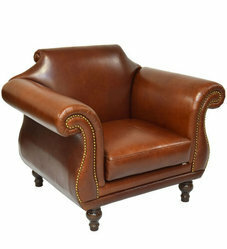 Shown here is a 4 Seater Regiment sofa in Chestnut Vintage Scrunched Leather. As beautiful as it is comfortable, Kraft Tree Chesterfield collection in leather with classic rolled arms and diamond-tuft backs with leather buttons brings in enormous charm to your living room and is a handcrafted masterpiece by one of our 4th Generation sofa artisans. 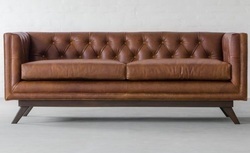 Shown here is a 1 Seater sofa in Chestnut Leather. For Seats, choose standard fill (poly fiber wrapped around 4" foam core) or down-blend fill (feather and down wrapped around a 4" foam core). 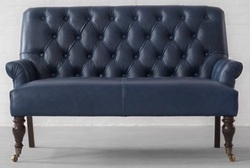 Shown here is a 1 Seater Sofa in Indigo Leather. Meticulous hand craftsmanship and signature deep tufting make the Manchester Chesterfield Sofa a masterpiece and adds the classic old world charm to any space. With all over hand-tufting on the seat, back and arms, this sofa reminds us of the opulent tradition of 19th-century British men's libraries and clubs. With its carefully crafted proportions, the comfort and the style provided by this sofa are surely you will cherish for life. Tufted tight back and fixed seat. 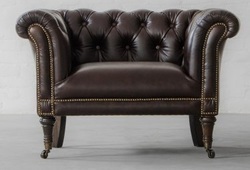 Shown here is the Manchester Chesterfield 1 Seater sofa in Espresso Leather. 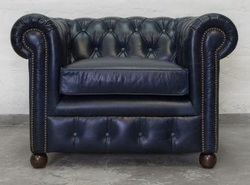 Shown here is the Manchester Chesterfield 2 Seater sofa in Ebony Leather. 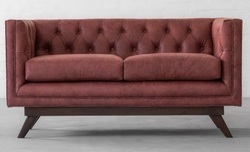 Deep hand-tufting and bold scroll arms. Accented with hand-applied antique brass nailheads. 8 way hand tied coil spring suspension. Assembly No assembly required. The product comes ready to use. 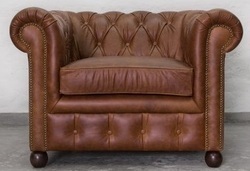 Shown here is the Manchester Chesterfield 3 Seater sofa in Italian Vintage Tobacco Leather. Shown here is the Oxford Chesterfield Two Seater sofa in Italian Laguna Desert Leather. We got inspired by the beautiful Kraft Tree town in the Kashmir Valley. This charming sofa has a carefully hand-tufted, quilted look covered with our exclusive and supple natural leather. The internal frame and the tapered, handcrafted ringed legs are made in solid kiln dried wood to last years of usage. 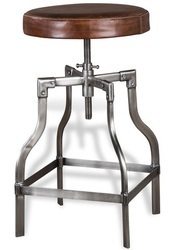 These legs are accented by high quality imported brass casters in front. 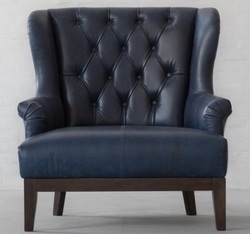 Shown here is a 2 Seater in Vintage Scrunched Indigo Leather. 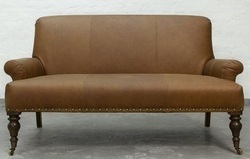 Shown here is a 3 Seater in Olive Leather. 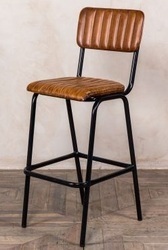 The 'Arlington' stool comes with either a tan or ash black seat and back. 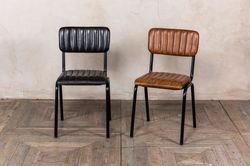 The seats and backs are beautifully finished with ribbed stitching and sit upon a strong, industrial style, steel frame. The welded tubular steel frame has an onyx black, powder-coated finish. The frame also has an extended footrest for added comfort. 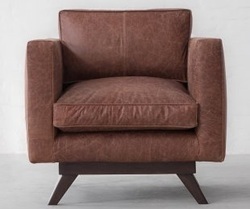 With its plush, padded comfort, our Samode leather armchair is ready to support you during long conversations on the phone or with guests. 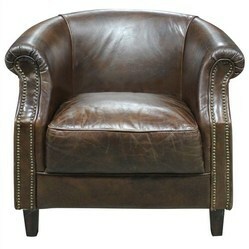 Expertly handcrafted in our premium range of Leathers, this chair is great on comfort and functionality. A row of antiqued brass nailheads along the border completes the look. A Perfect piece of furniture as a single piece or a pair in a bedroom, living room or study. Hand crafted legs in walnut finish. Carefully hand-applied antique brass nail-heads. Seat with polyfiber or Down feather blend wrapped around foam core. Made in 100% Genuine Leather in Italian and Indian selection. 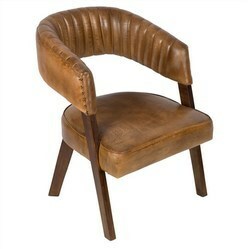 Shown here is a Samode Chair in Chestnut Leather. Masterfully upholstered in superior vintage looking pure leather, our Carlton Sofa has a distinguished look and is built to last. It’s designed with a deep seat for unparalleled comfort. 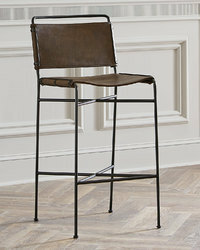 Intricately hand turned legs and subtle style lines in the back and seat are complimented by the stylish set back arms. High quality imported brass casters in front. Also available without casters. Please call our Customer Care to give your choice. 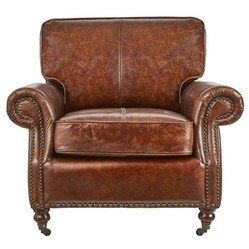 Shown here is a Two seater in Chestnut leather. 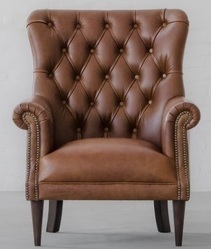 Our beautifully crafted Vintage Leather Club Chair, birch timer feet, this chair will create a sense of grandeur in your home. Perfect for the office, study or lounge room, you will enjoy the comfort of this traditionally designed piece. Seat with poly fiber or down feather wrapped around Super Soft foam core. 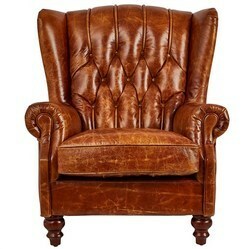 Shown here is a Candolim Leather Wing back in Chestnut Leather. 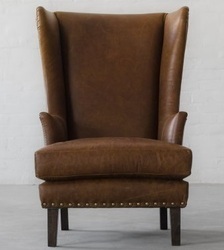 Traditionally the purpose of the 'wings' in a wing chair was to enclose the head or torso areas of the body in order to provide comfortable protection from cold drafts, and to trap the heat from a fireplace in the area where the person would be sitting. In historic times these are often used near a fireplace. Today, these chairs work beautifully as stylized accent pieces in a room, whether living, study or a bedroom. 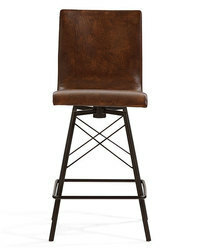 Each chair is handcrafted of the finest leather and comes with a comfortable seat cushion. Special finish given to the leather to get an antique aged effect. There may be variations in one piece from the other. Seat with polyfiber wrapped around foam core. Assembly Do It Yourself (DIY) assembly with minimal effort with the help of instruction sheet provided in the toolkit. 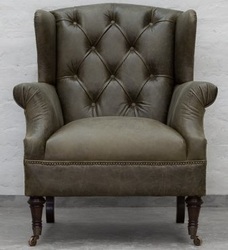 Shown here is a Ballard Estate Wing back Leather armchair in Vintage Scrunched Olive Leather. Seat with foam wrapped with Polyfiber. Available in 20 Leather Options.